[1:03] <crfreaks> I have a newbie question. What is the purpose of a Raspberry PI Cluster? Will say Ubuntu see all the nodes ? [1:10] <shiftplusone> Ah okay, just making sure you were't thinking you can use a cluster to 'speed up' your PC overall. [1:11] <shiftplusone> Pi clusters are usually used for education, rather than any real practical uses. It's much more energy efficient and faster to just use a PC. [1:13] <crfreaks> ok thats what i was thinking, becuase there are these and then the atom boards used for littlefe. [3:04] <ldiamond> I'm looking for a cheap but good USB hub for my Pi. I want to power the pi and eventually external hard drives. [3:04] <ldiamond> Though the pi doesn't support USB3.0 I'd prefer a USB3.0 hub so that I can use it in the future with USB3.0 devices. [3:05] <ldiamond> Anyone have recommendations? [3:43] <alpha1125> Anyone happen to know if there's an easy way to pair a BT dongle, to a BT receiver module that can talk to each other (serial? or something else?)? End goal, to toggle some relays, but over BT. The source just happens to be either a RPi, or a Handset. [4:41] <[Saint]> Primera: Such questions are pretty much guaranteed to have the exact opposite effect than the one you desire. [4:41] <[Saint]> If you want some support, ask a direct question. [4:41] <[Saint]> If you want some company, go outside. [4:45] <[Saint]> I just wanted to make sure that you weren't looking for support. [4:45] <[Saint]> Its shocking how many people come in, as exactly the same question you asked, and then leave ~2 minutes later because (shockingly...not) no one answered them. [4:47] <[Saint]> People are *certainly* there. [4:47] <[Saint]> But, as I said, its almost a certainty that no one will answer such questions. [4:48] <[Saint]> The only reason I answered was to a: make sure you weren't looking for support, and b: explain why no one answered. [4:50] <Primera> no one in there = no one active in there. [4:50] <[Saint]> The thing we're trying to point out is that most people won't respond to the equivalent of "is anyone here?" [4:50] <[Saint]> because...its obvious there is. [4:53] <[Saint]> And while "soon as 1-2 people start talking & user * notices. They are more likely to also join in" is /somewhat/ true, it usually involves OP having something valuable to contribute, or requesting support. [4:53] <[Saint]> Of which the above statement was neither. [12:03] <treeherder> where does one find an 11 volt supply to overvolt the pi? or can i just use 12 at that point? [12:12] <treeherder> or are you just making things up? [12:12] <mfa298> I know a little about overclocking. but I've spent a lot of time looking at the rpi schematic. [12:13] <treeherder> ok well over clocking requires overvoltage input through the power in, so i think you might be misremembering or reading an old schematic? [12:14] <mfa298> if you're putting more voltage into the 5v pins then that isn't going to get anywhere near the actual chip. [12:15] <treeherder> so you think i should apply overvoltage to the line behind the polyfuse? [12:16] <mfa298> if you need to put more power into the actual chip you either need to put it on the 3v3 line (available on the header) or replace the regulator on the board. [12:19] <mfa298> but be aware that if you're putting more voltage onto the 5v line and have hdmi or usb devices connected you could also fry them as well as the pi. [12:34] <gordonDrogon> treeherder, the internal voltage to the arm & cpu cores is software controled - you don't do it by upping the incoming 5v supply at all. [12:40] <gordonDrogon> treeherder, that is correct. [12:41] <[Saint]> You're quite correct, though, about there being an awful lot of misinformation out there. [12:42] <[Saint]> There's so many tutorials in there that call for everything just short of voodoo rituals and sacrificing virgins. [12:44] <[Saint]> IFF the driver is cupported/installed, that's trivial - yes. [12:44] <[Saint]> If not - voodoo tutorials. [13:27] <Bhaal> Quick GPIO question, can the GPIO pins which also have other things on them like SCLK and MISO still be used as regular GPIO pins? [13:37] <treeherder> do you think this lm 2596 switching regulator will be sufficient to provide clean power to my i2c devices so that i dont need a ton of logic level shifting? [13:49] <gordonDrogon> in theory ... you can use 5v devices with the Pi's 3.3v I2C - as long as it's the Pi that pulls the lines high, however some fast I2C devices actively pull the bus up the 5v to try to make it run faster. [13:50] <gordonDrogon> so if you wanted to use e.g. a mcp23017 (16-pin gpio exapnder) and drive that at 5v then it should work directly to the Pi. [14:29] <kill_box> anyone have tips/tuts/ideas on setting up multiple video cameras and a mic on a rasp pi? or am i asking too much? [14:34] <pksato> kill_box: using dozens of webcams or usb capture devices. [14:40] <kill_box> pksato: i guess i am little dense here, can you be more specific? I saw a cam module on the rasp pi site, but there is only one dedicated interface for it.. i suppose by usb capture device you mean using a usb hub with usb cams? [14:42] <pksato> no. usb NTSC tv capture. [14:42] <pksato> or USB webcams. [14:50] <N3sh108> Does anyone know how to solve this? [15:23] <treeherder> ShorTie, i have a ton of devices that are 3-5v so if i just power them all at 3 v i don't have to worry about shifting logic, yeah? [15:34] <N3sh108> I am trying to have my script running that before doing the rest and see what happens. [15:44] <CharlieBra7o> did anyone use spidev with a microcontroller or something?? [16:24] <elspru> how do I get command line php in raspbian? [16:24] <elspru> i need to run some php scripts from the command line. [17:48] <Yohio> google is full of raspberry pi cases, but has anyone here tested the $3 acrylic cases (including shipping) from ebay? [17:52] <Encrypt> Why not simply use it original case? [17:53] <shiftplusone> 'bad' in what way? A case is only needed if you think you might short things out, and any of them will prevent that from happening. [18:05] <lord4163> I have to restore an image I made a while ago, used dd with this and piped it into gzip I guess. Now how do I restore this? tar zxvf image.tar.gz || dd of=/dev/sdc bs=1M? [18:08] <shiftplusone> I'd need to look at the manpages to know for sure, but it's right in theory. [18:10] <CharlieBra7o> does anyone have a MSP430G2 board at hand by any chance??? [19:10] <plugwash> Does the website addres insideelectronics.co.uk , the IP 2001:41d0:2:c61d::1 or the name Ben Thompson mean anything to anyone here? [19:19] <shiftplusone> you don't have the space to break it into two steps? [19:20] <plugwash> Trying to deal with what appears to be a "mirror gone haywire"
[19:25] <atouk> do you have a thumbdrive that you can use as a work area? [19:30] <ShorTie> did you reboot with the lcd on ?? [19:32] <ShorTie> oops, day late and a dollar short as always, lol. [19:44] <nezZario> Does flash/youtube work any bit on the Ubuntu or deb distro? [20:23] <jarlopez> Hey peeps. I'm following the tutorial at http://wiki.osdev.org/ARM_RaspberryPi_Tutorial_C on writing a simple OS from scratch for the rpi. I'm having issues when compiling it, though, and I __think__ it's due to me being on a 64-bit machine and trying to compile for the 32-bit Pi. I'm running into the compiler error "__have_long64 is not defined" from <stdint.h>. Any suggestions? [20:41] <SuperWeirdBoy> Hi there, does someone have any experience setting up the new Wolfson audio card for the Raspberry Pi ? 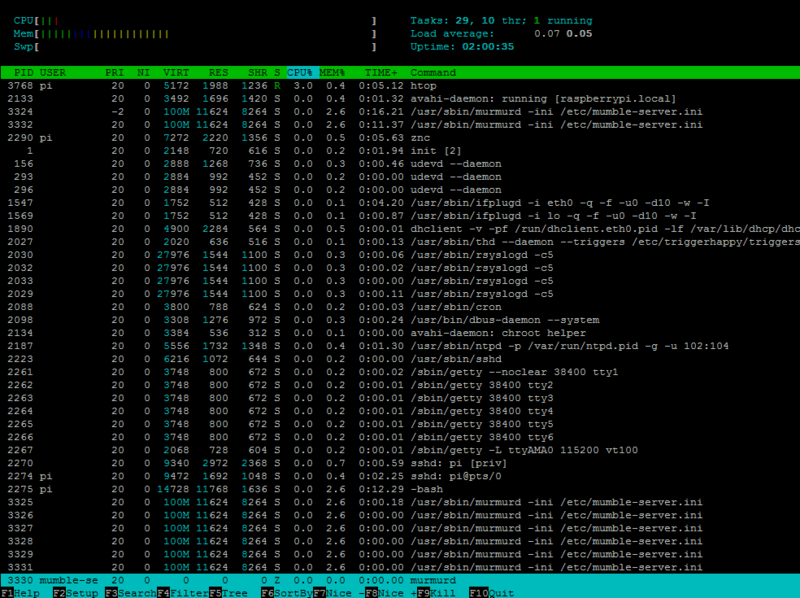 [20:47] <huesimon> I have a problem, i'm trying to host a mumble server on a raspberry pi. But it seems to lose it's internet now and then, is there anyone else that have unstabil internet with your Rasperry pi's? [20:50] <SuperWeirdBoy> Hi huesimon, Are you using the integrated ethernet (model B) or a WiFi dongle ? [20:52] <SuperWeirdBoy> can you monitor the activity (with htop for example) and get a value of the cpu usage with multiple users connected to the server ? [20:54] <shiftplusone> huesimon, is your tp1-tp2 voltage steady near 5v? [20:56] <SuperWeirdBoy> the usage is very low, were people saying atm you took your shot ? [20:59] <bewl> does it lose connection when you dont have murmur running? [21:04] <Willd> Hi! Has anyone seen any work on a an opengl based gif decoder for the Pi? [22:18] <shiftplusone> have you read through http://wiringpi.com/dev-lib/ ? [22:21] <BCMM> shiftplusone: ah, i was browsing the github page - i guess that's an old copy of the code? [22:21] <shiftplusone> Gordon has nothing to do with it, as I understand it. [22:25] <shiftplusone> the 'correct' place to get it is actually wiringpi.com, not drogon.net, but in any case, it should be there. [22:25] <shiftplusone> did you find the header file? [22:25] <BCMM> shiftplusone: is there a git repo at wiringpi.com? [22:26] <shiftplusone> "git clone git://git.drogon.net/wiringPi"
[22:33] <BCMM> the only problem is that "when somebody bumps SRCREV" is "not very often"
[22:51] <tootights> I've come into some free 1/24 s1000 telecom wire. I was thinking of using this to remotely place a motion sensor module, camera module, and other modules maybe,... Id on't know will this work? [22:51] <tootights> if so what kind of distances will i be able to get? [22:55] <tootights> hm. no se? [22:57] <IT_Sean> It is highly unlikely that anyone has done that using the exact same cable, and therefore, we can't really even begin to guesstimate. [22:58] <IT_Sean> I know that people have been able to extend the camera module out to several meters. However, that is using the proper type of cable... not something salvaged off a sunken Russian barge. [22:58] <tootights> can raspi accept PoE? [22:58] <IT_Sean> Not natively, no. You would need a breakout adapter on each end. [22:59] <tootights> You ever use those rj45 to usb things? [23:45] <gordonDrogon> BCMM, I created wiringpi.com after I did the stuff with *.drogon.net. [23:45] <gordonDrogon> it's an older snapshot for his python, ruby, etc. wrappers. [23:52] <gordonDrogon> Seems to be yet another build tool. [23:53] <BCMM> gordonDrogon: not "build tool" as in "make replacement". it builds a whole root filesystem from scratch. [23:54] <gordonDrogon> sounds interesting, but if they have to replace the standard Makefile that comes with every other package, it also sounds like a complete nightmare.